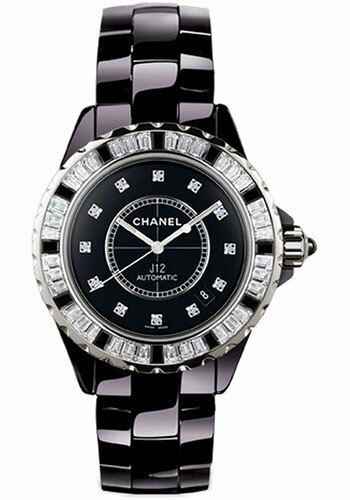 33mm black ceramic case, black ceramic bezel set with 36 baguette diamonds, highly scratch-resistant crystal, black dial with 12 diamonds, automatic movement with hours, minutes, seconds, date, black strap, ceramic bracelet. 33 mm 18K white gold case with black high-tech ceramic, screw-down crown, 18K white gold bezel with 48 baguette-cut diamonds, black dial with 84 baguette-cut diamonds - 2.4K and 12 baguette-cut black high-tech ceramic indicators, self-winding movement with hours, minutes, seconds, approximately 42 hour of power reserve, ceramic bracelet, triple-folding buckle with 18K white gold. Water resistant to 100 meters. 33 mm 18K white gold case with black high-tech ceramic, titanium back, 18K white gold bezel with 34 baguette-cut diamonds - 2.54K, black dial with 12 baguette-cut diamond indicators - 0.41K, self-winding movement with hours, minutes, seconds, approximately 42 hour of power reserve, ceramic bracelet, triple-folding buckle. Water resistant to 50 meters. 33 mm black ceramic case, screw-down crown, steel bezel, black dial with numerals, self-winding movement with hours, minutes, seconds, approximately 42 hour of power reserve, ceramic and steel bracelet, triple-folding buckle. Water resistant to 200 meters.